SolidCAM provides a most comprehensive turning package with powerful toolpaths and techniques for fast and efficient turning. 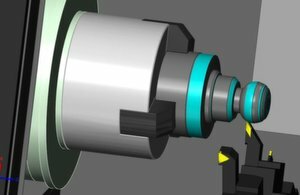 SolidCAM Turning provides functionality for a wide range of machine tools, including 2-Axis lathes, multi-turret configurations, sub-spindle turning centres and mill/turn machines. 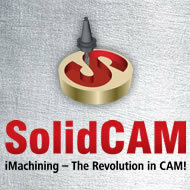 SolidCAM produces advanced rough and finish profile turning, together with support for facing, grooving, threading and drilling in either canned cycles or longhand format. Toolpath calculation takes into consideration the complete tooling insert and tool Holder, including previously machined material to avoid gouging and eliminate air cutting. Standard fixture libraries are available and specialized fixtures can be added. SolidCAM has the ability to keep the stock updated live within the operations tree. Updated stock is supported from the most basic 2 axis turning centre, right through to a CYB multi turret sub spindle Mill/ Turn. On a sub spindle turning centre, when a component is transferred from the main spindle to the sub spindle, the updated livestock transfers with it. Any subsequent machining on the sub spindle will detect the stock in the state that it left the main spindle, ultimately providing the most efficient machining sequence possible. Manual turning: perform turning according to user-defined geometry, regardless of stock and target model. 4th axis sim. turning: performs machining of curved profile using B-axis tilting capabilities of tool, in order to machine undercut areas in a single machining step.